LYNCHBURG—Randolph College President Bradley W. Bateman announced today the return to the College of Ernest Martin Hennings’s Through the Arroyo and the establishment of an endowment to fund a director of education position at the Maier Museum of Art at Randolph College, internships at the National Gallery, London, and other visual arts education programs provided by the proceeds of the sale of Edward Hicks’s A Peaceable Kingdom. 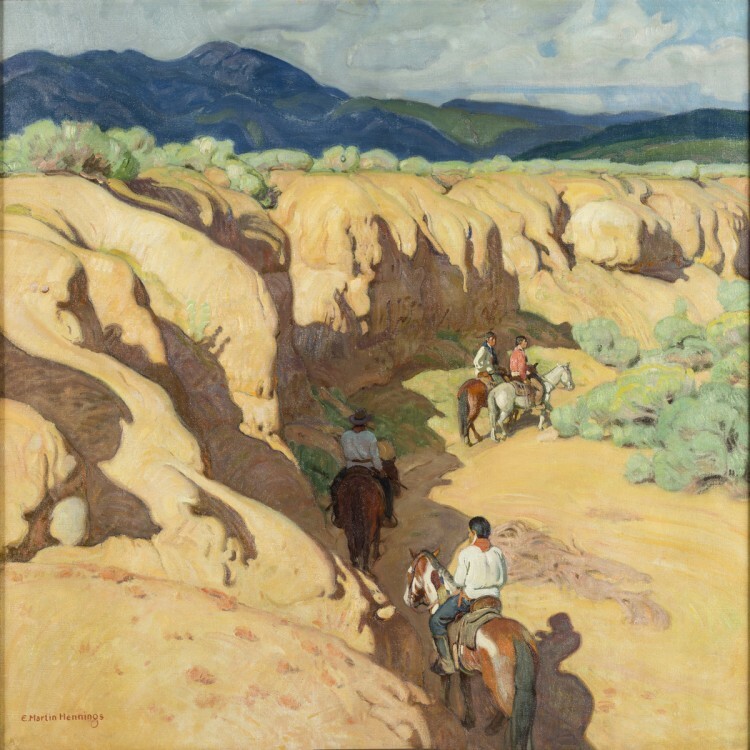 An anonymous donor who purchased Through the Arroyo has returned the painting to Randolph on loan. This generosity allows the College to once again house this important piece of artwork. The piece is now on exhibit in the Maier. In addition, the Board of Trustees has decided to use proceeds from the sale of A Peaceable Kingdom to firmly assert its support of the work of the Maier and the College’s visual arts program through the establishment of the endowment supporting the director of education position, internships, and other visual arts education programs. The announcement brings to closure a plan developed in 2007 when Randolph College’s Board of Trustees made the decision to sell four pieces of art from its extensive collection. In 2008, one painting, Rufino Tamayo’s Troubadour, was sold. In addition, Randolph announced the sale of Men of the Docks by George Bellows in February 2014. The sale resulted in a unique partnership between Randolph and the National Gallery, London, the only one of its kind between a U.S. educational institution and the Gallery. The College recently announced that Elisabeth Price ’16 and Seisha Scott ’16 will become the first participants in the new internship program, established as part of this academic partnership. As with these two previous paintings, the proceeds from the sales announced today will be invested into the College’s endowment. The two paintings were sold in private sales and purchase prices will remain confidential. “The sale of the paintings not only ensures the financial sustainability of our institution, it allows Randolph to continue with its mission of providing students with a strong liberal arts foundation and academically enriching experiences, including access to a collection of American art that remains exceptional,” Bateman said in a letter to the Randolph community. “This announcement also brings closure to a difficult period in the College’s history. The Board of Trustees made the hard decision in 2007 to sell these four paintings. That job is now complete, and the Board has no intention of selling any additional paintings. This decision is our past, and now we must turn to the future.